Stevia sweetener has numerous harmful and side effects on a human body. Most of the people wants to avoid sugar to prevent them from being fat as well as diabetes. In such cases, people goes for the option of Stevia. Stevia is a sweetener that is naturally low in calories and does not raise your blood sugar level when consumed. FDA has not approved its usage due to its severe negative effects on the body. 3) Metabolism Change : Large amounts of stevia consumption results in drastic metabolism change. It slows down the metabolism and thus body abilities to convert carbohydrates into energy reduces. In some cases, it also generates bad cholesterol. 4) Diabetes : It severely lowers to blood sugar levels. 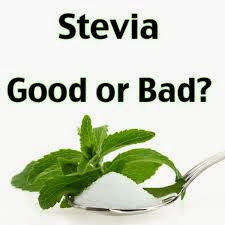 5) Lower Blood Pressure : There is some concern that if people who already have low blood pressure consume large amounts of Stevia products it can cause their blood pressure to drop to a point which can be dangerous. 6) Dizziness : Some people face dizziness just after the consumption but it does not last long. 7) Muscle Pain : People who are involved in heavy exercises generally re-creates lots of muscles using the proteins consumed. But stevia consumption slows down the muscle repair process resulting in muscle pain.